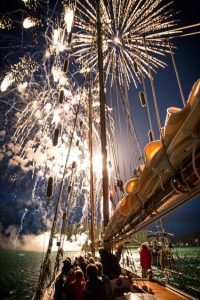 Schooners North has a sailing adventure to match every budget and schedule, from two hour evening sails to extended voyages and private charters. Our friendly and knowledgeable crew is here to serve you and help make your stay in the Islands a wonderful experience. We can help you with lunches and beverages including soft drinks beer or wine. We can recommend accommodations and help you plan the perfect outing when visiting San Juan Island, so please call if you have any questions about our services or just need some “local knowledge”. We look forward to hearing from you, 360 378-2224 info@schoonersnorth.com. Visit our Private Charters page for more information on pricing. Or call our friendly staff at 360-378-2224. 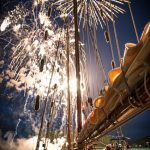 Our 4th of July Fireworks sailing last year was spectacular! And Friday Harbor’s fireworks display over the harbor was better than ever. It’s not too early to book your spot for 2017. Join us on Spike Africa for the best view of the Fireworks in Friday Harbor, WA. Annual Port Townsend Wooden Boat Show. This festival famously attracts wooden vessels of all shapes and sizes. The festival offers educational seminars as well as a plethora of marine related gear, clothing, food vendors, a beer garden, and stage for a variety of performances from music, poetry, stories, and education.The festival usually sells out the town. Travel and sleep aboard Spike Africa for the ultimate nautical weekend. Travel & stay aboard for two couples (4 days and nights) $999.00/person. ALSO available: One-way or round trip from Friday Harbor to Port Townsend. $99.00/person each way. Call 360 378-2224 for space availability. Even when it’s warm and sunny on shore it’s often much cooler out on the water, especially if there’s a good sailing breeze. For your comfort we suggest that you dress in layers, if you get too warm you can always lose a layer, and be sure to bring a jacket that can shed water and act as a windbreaker. As for footwear, something that’s comfortable and allows you to safely move around on deck. Don’t forget sunscreen, the water really reflects the sun. We require a 50% deposit to hold your reservation. 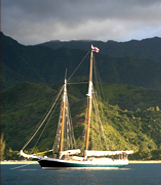 The deposit is refundable up to 30 days prior to booked sailing. Should Schooners North be required to cancel a trip for any unforeseen reason, including lack of adequate registration for that trip, you will receive a full refund of any money paid to us. Box lunches are available through the Cask & Schooner Public House & Restaurant. All box lunches include sandwiches served on fresh Bakery San Juan Giovani Bread, salad, sweet treat, San Pellegrino sparkling water, napkins & utensils. Sandwich choices may include the following: smoked salmon, drunken chicken, skirt steak, smoked ham, veggie or a rustic blt. Also available for an additional cost are: coffee, tea, Dry soda, root beer, ginger beer, Growlers, wine and hard cider. Please proved 24 hour notice, payment is due upon order, please mention any dietary restrictions. Box lunches start at $23. 360-298-4002. Cask & Schooner, 1 Front St., Friday Harbor, WA 98250.